There are different levels of editing, from developmental editing to copy editing and proofreading. Should you go through all the phases of editing? Each has its own purpose. Do beta readers cut down on editing costs? Most 1-Star Amazon reviews are due to typos and grammatical mistakes. If you don’t have the money for an editor, try bartering. Does the author have to accept all editors’ changes? What editing services are available? A checklist of things to look for in an editor. 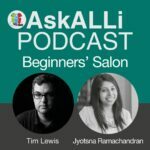 Thanks to Jyotsna and Tim for this great podcast – some really useful tips for authors to consider when they are thinking about editing for their book. Just one small thing – they didn’t mention that ALLi has a section for editors, all of whom are Partner Members and vetted by ALLi, in the ALLi Partner Directory, which makes it another good place to look for professional editors in addition to the professional associations and other sites mentioned in the podcast. And, yes, I am biased, but I am proud to be an ALLi Partner Member.